A screenshot is worth a thousand words. 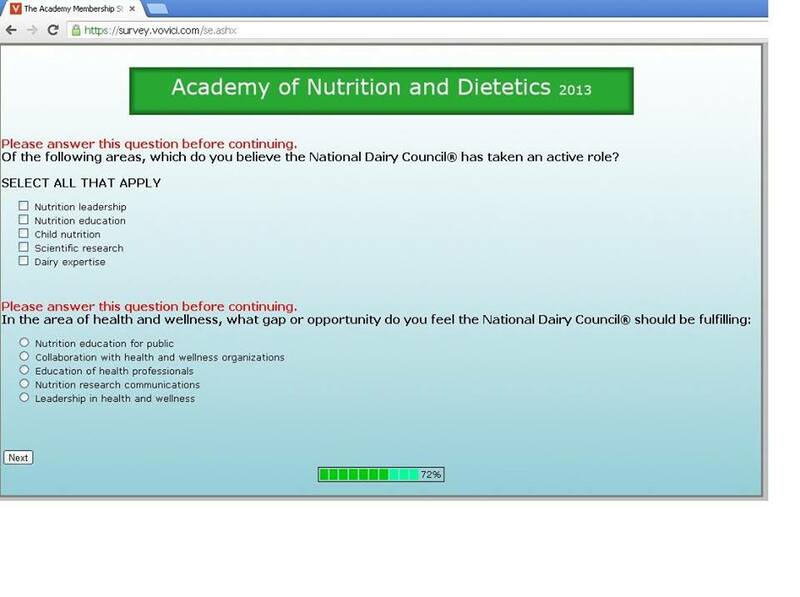 What you see here is part of an electronic questionnaire that some dietitians received after the Academy’s 2012 conference held in Philadelphia. This is very worrisome because it disproportionately skews data (the Academy could technically go on to state that “100% of RDs who took this survey see an area of opportunity for the Dairy Council to fulfill”), and does not give the Academy any indication of how many of its constituents don’t want the Dairy Council — or any other current Academy partner — to be involved in nutrition research, nutrition education, or leadership in health and wellness. This is precisely why Dietitians For Professional Integrity believes it is crucial for Academy members to be surveyed on the issue of the current corporate partnerships (the Academy has taken issue with prior surveys on this topic done by other dietetic practice groups; so we think it is time for it to collaborate on a survey that all parties are satisfied with so that results can’t be dismissed or ignored). One thing is for sure; favoring surveys for Academy partners doesn’t address any of the concerns many constituents have.